This year I am delighted to be exhibiting as part of The Select Art Trail, on 12th-13th and 18th-19th May 2019. I am very lucky to be able to show my work alongside my friend and neighbour, artist Hannah Linfoot, who very generously offered me a space at her lovely home, right on the top of Minchinhampton Common (Chesapeake, Moor Court, Amberley, GL5 5GA). There are also many other Amberley Artisans exhibiting within walking distance (see examples of work below); Alison Vickery, Galina Gardiner, Clare Bassett, Nicki Schmiegelow (with guest artist Barbara Spence), Steve Mansfield, Tom Knowles Jackson and Adrian Bates. Alice Sheppard Fidler and Daisy Murdoch also have studios open during those weekends. With such talent and variety, with beautiful views and good pubs for walkers, we are hoping many people will take the opportunity to make the most of Amberley as part of the wider trail. I am noting down many other locations around the Five Valleys that I must try and get to. So please do come along. I will be using the occasion to show lots of new things, and would love to see you. 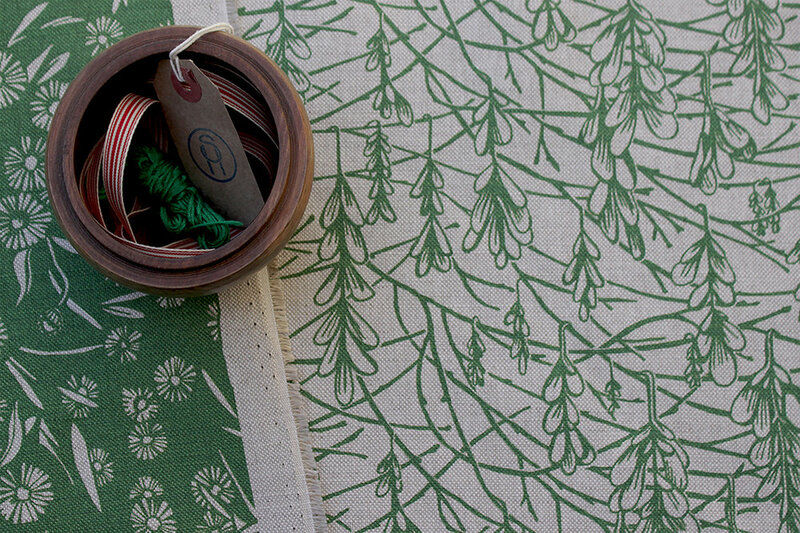 I am delighted to be launching four new fabric designs on my website today. Forming more of a mini-collection, working along a loose theme, rather than a full bi-annual collection – I hope these four designs all strike a note in their own right. There are many more designs to follow, in my head, on paper, and in the pipeline... but the sporadic approach is just how life is these days. I have come to realise I am very much someone who likes to see a job finished. I am a finisher: this is my natural state... or I should say, it was. Ideally, I like something to be completed, and I would rather stay up far too late, but work in the detail. Not knowing when to stop, is more of the issue here... I have never been good at keeping things simple. But since having my kids, I have had to come to accept things happen at a different pace. Work is in snatched moments, work is whilst cooking supper, and most of all, work is at night. Furthermore, my business is funded by itself, and in fits and starts. I can't always bring something out when I am ready. I can't always be ready, when I want to be ready. But I have discovered that this doesn't matter as much as I thought it did. It can be very frustrating, and things may not be happening at the pace I would have once expected of myself, but it is happening all the same. The same applies to my garden and my house. Imagine if it ever felt 'done'! So some of these designs have been around longer than others, but that allows me to see there is a common thread. The inspiration for each fabric spans the seasons; from daisies to snowdrops, but they all focus on the delicate details. Things I spot, whenever I spot them, seem to catch my eye for their undisturbed beauty, and that is what I try to capture. Sometimes nature has almost already worked out the repeat; I spotted it for its pattern. At other times, the pattern came about through experimentation; shuffling elements about on page or screen. So my process is also sporadic now... more unpredictable than the former me would have allowed. But somehow things hang together, and then I just need to get it to you. Which is what I have been doing lately. So Mariesii, Daisy Daisy, Sycamore and Romilly are available in a range of colours, from bright to subtle. And if there is a colour I haven't got, please talk to me about custom colourways (on orders over 5m). I have some cushions ready made, but can make up more to order if this runs out, or if you want something a bit different. Like this long bolster cushion in Mariesii (Jay Blue) with hot pink contrast piping. Let your imagination run wild! Or let mine run wilder, if you like... just get in touch. Lampshades too, and of course curtain and blind fabric by the metre, are available to order via this site or email. That's it for now... but just incase you are interested in what else has been going on with me lately, this little gallery below sums up my summer. Or at least it sums up what has been inspiring me, and leaves out a lot of the less inspiring bits: telling children to stop arguing, constant meal making, emptying out old picnic bags, drying swimming gear, answering emails. You don't need me to show you what that is like, I am sure. To celebrate the May Bank Holiday please enter the discount code BLUEBELL to your order at the checkout, to receive free or discounted shipping to the UK, depending on the size of your order. This offer ends at midnight on Monday. This cold weather hopefully ends sooner! Before I knew if, Christmas was over, the year was new, and we were back to early mornings and the school run. But before getting my nose completely back to the grindstone I thought it worth documenting a couple of projects I finished over the break. One, a very garish lampshade made from lots of my fabric off-cuts and colourways that I didn't end up printing, is now lighting my sitting room and definitely brightens the whole place up. Mind you, I am quite keen on a bit of clash. Other projects include this teepee for my three daughters. I was tempted to make it entirely out of pattern but couldn't justify the cost... so they ended up with a calico teepee with trim of Peony Bee in Dandelion. I can't say they've noticed. But, it has been popular, and I am often asked in to the teepee for tea. However, we now need an extension to accommodate it. I had better sell some more fabric. The rest of the holiday was spent keeping three young children amused in the rain. Roll on Spring! It has been a REALLY busy few weeks for me (and everyone no doubt), with the run up to Christmas seeing me running around like a headless chicken. Or a headless turkey. Sorry, that was rather crude. In the last few weeks I have had some exciting fabric deliveries of two new designs, and so am busy photographing and refining colourways, with the intention of making them available to all in the New Year. In the meantime, the house – now newly decked in Christmas wonderment by my kids, is feeling rather full! So I am offering free postage and packaging on cushions for the next few days, in order to see if I can spread the cushion love and make some space for all the Christmas presents I soon expect to receive. This will run until Tuesday December 15th at midnight. This photo shows all of the stock currently available here, and is summarised in the list below. You will see zero cost added to your cart for postage and packing.